Next generation 1-DIN Mechafree with Bluetooth, USB and Spotify. Connects to iPhone & Android devices..
Smartphone connectivity and Bluetooth, in one! The attractive, 1-DIN design of the MVH-S510BT offers plenty of room to display useful information. It also has a large Rotary Commander and easy to access preset buttons, so you can instantly select your favourite FM stations and more. The MVH-S510BT (No Suggestions) digital tuner is fully compatible with Spotify, both for Free and Premium Spotify users. Simply connect your iPhone or Android smartphone and safely enjoy your favourite playlists, albums, tracks and artists. Bluetooth connectivity allows for safe and convenient hands-free calling, as well as wireless music streaming from your smartphone. 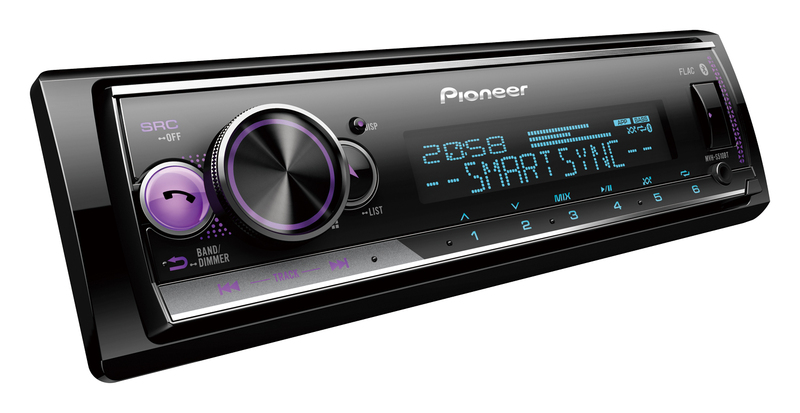 Thanks to Pioneer’s unique Advanced Sound Retriever technology, the sound quality will be as close to the original recording as possible. You can even connect two Bluetooth phones simultaneously. Make no mistake, the MVH-S510BT is a true high-end car audio system. It reads FLAC files, is equipped with a 13-band Graphic EQ, an on-board 4 x 50 Watts MOSFET amplifier, and when paired with Pioneer's Smart Sync app, takes smartphone connectivity to a whole new level. Made for iPhoneWith iPhone Direct Control, you can manage your i-device directly from your car dashboard and enjoy superior sound.